Its summer and car’s heating up, malfunctioning or catching fire is not exactly out of the ordinary. With temperatures touching 50 degrees Celsius and iffy electrical work by local car mechanics, you just can’t be careful enough. We have recently seen a trend where cars catch fire and burn to a crisp. Whether it’s a New Honda Civic or an old Suzuki Khyber, for some inexplicable reason cars are catching fire and the government is mum on the matter. Car manufacturers have also shown no interest in investigating the issue. Regardless, car owners should always be prepared for such a scenario as it could save you hundreds of thousands of rupees in car repair costs. Therefore, we have prepared a list of possible solutions when your car overheats or begins to show signs of a fire. The most important factor in preventing an accident is to take precautionary measures. We have compiled a list of steps that could prevent a car fire. Do not use electrical wiring alterations and if necessary, make sure your electrician is an expert and employs proper safety measures like relays and fuses while insulating the wiring. Never compromise on your car’s electrical work. Use high quality wires and equipment. Do not put extra burden on your car’s wiring by installing equipment which needs too much current from your vehicle, e.g. installing HIDs on a stock Mehran is a recipe for disaster. Check radiator water everyday. Make sure coolant is in good condition and the extra water reservoir is filled to the marked level (Never fill the water container to full). Make sure your radiator fan is working. 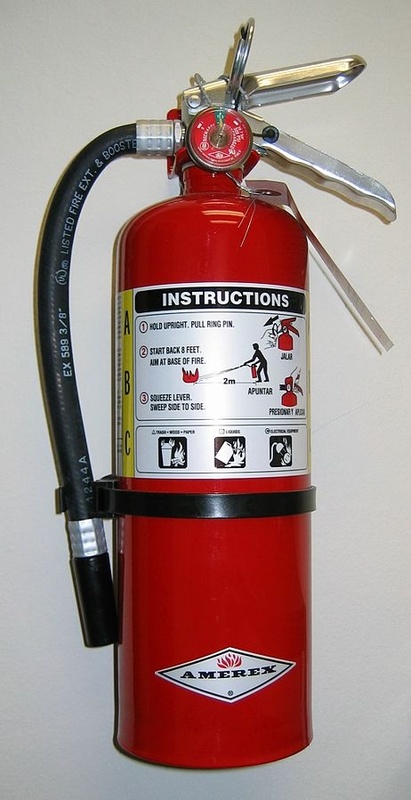 Always keep a fire extinguisher in your car. Make sure battery terminals are properly connected and insulated. Check for any fuel leakage. Make sure car’s generator isn’t damaged. Check brakes when starting your journey. Make sure your temperature gauge is working. Use a good quality coolant. Cars catching fire or overheating is common but people still have very little knowledge of how to deal with such issues. Fires in car are drastically different from the regular ones and should therefore be treated differently. Do not throw water at a car once it catches fire. Electrical wires often melt and throwing water could worsen the situation. Do not blow air towards the fire. Use sand or any other dry (but non-flammable) stuff towards the fire. To put off the fire, oxygen supply needs to be restrained and this can only be done by covering it with non-flammable material. When a car heats up, never turn off the engine. Turn on the blower at max and set it to hot (don’t turn on the AC). Keep it running and open the bonnet and pour water on the radiator. Once it cools down slightly, take a piece of cloth and open the radiator slowly it while maintaining a safe distance and add more water. While such accidents, especially cars overheating, tend to happen more often during summers, the car burning incidents we are seeing today are not related to that. It’s either a manufacturing fault or something similar. The government and the car makers need to investigate the matter. Some of the incidents might be related to poor wiring and HIDs but it’s incomprehensible that all incidents are due to the same reason. Whether the authorities do something or not, the public can take precautions and do their best to avoid any problems. We advise you to keep safe and help others in their time of need. Share this with your friends so that you can avoid being the next victim. In case we missed anything, share your knowledge with your fellow readers in the comments section below. Run away if car catches fire …u missed it writer. “Keeping fire extinguisher in the car” is the strongest point. Jagh Bhi Bata Jaye Kaha Or Kitne Kilo Or Kun Se Chemical (Water, Form, Etc) Wala Rackhe ? Gari ki diggi mein aa jata he ye araam se. They should also be available in spray cans. Never Put Perfumes, Deodorants in the Dashboard. They are highly inflammable can cause severe damage in scorching Summer. Most Important: Remove positive terminal of your car battery otherwise the fire will spread to whole wiring. i had some experience with old Honda car engine, so there’s a tip before you open radiator cap, take a well soaked cloth, place it on the top of the radiator cap and then slowly open the cap. it will cover hot steam. another one. before you open the lid (radiator cap) press radiator pipe lightly to check the steam pressure it will help you to tackle the steam.